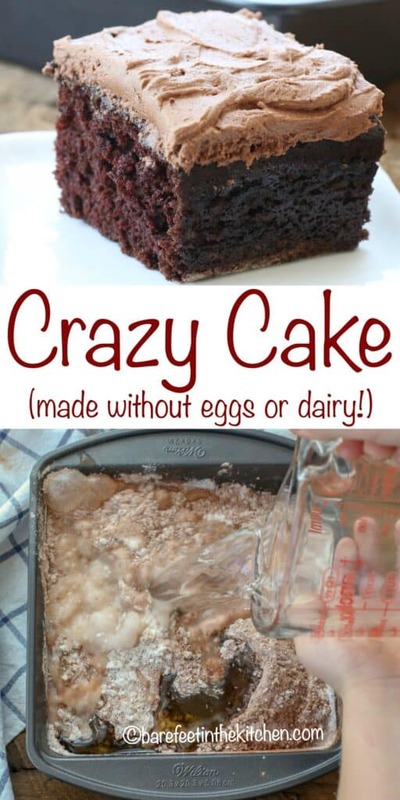 Chocolate Crazy Cake is one of the easiest cakes you’ll ever make. Like my beloved Cinnamon Toast Cake, this is an egg-free cake, but the Crazy Cake also requires no dairy. This makes it the perfect dessert to make on a whim with little more than a handful of things from the pantry. I’m willing to bet that if you could peek inside your grandmother’s recipe box, you might find this recipe. 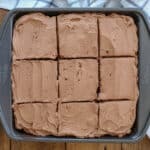 Also called a Wacky Cake, Depression Cake or War Cake, this Chocolate Crazy Cake is a simple chocolate cake that requires no dairy and no eggs. The Crazy Cake was created during World War I when ingredients were difficult to find and purchase. Dessert was a luxury during those times and this cake helped make it possible to enjoy an occasional sweet treat. The basic recipe for this Chocolate Crazy Cake is simple as can be with just a handful of ingredients. It’s terrific with just a sprinkling of powdered sugar over the top. To make it a little fancier, I chose to frost the cake with my favorite Fluffy Chocolate Frosting. If you need a dairy free frosting or a vegan cake, this Rich Chocolate Vegan Frosting or this Vegan Maple Cream Frosting would be perfect for that. While it might sound silly to follow these directions exactly, trust me here. It’s easy as can be and the clean up is a breeze. Grease the pan, add the dry ingredients and make wells in the flour for the wet ingredients. Pour water over the top and stir or whisk well with a fork until the wet and dry ingredients are well incorporated. I’ve been making this cake for more years than I can remember and I’ve always made it as written. As I was making this cake to photograph and share with you, I wanted to add a note to the recipe that says, feel free to just mix the cake batter in a bowl if that’s your preference. HOWEVER, I tried that twice and the cake turned out lopsided. How is that even possible? I can’t figure out if that’s a weird fluke or actual food science, but I recommend that you make it as written. I’ve said more than once that “good enough for gluten free” simply doesn’t cut it here. I test most gluten free baked goods side by side with their traditional counterparts and the gluten free variations I tried for the crazy cake recipe were simply not the same. I will continue to work on this one and will update here if I find a substitute truly on par with the original. If you must have a gluten free crazy cake recipe today, I’ve included the best adaptation I’ve found so far in the recipe notes. The gluten free crazy cake is tasty, but there is something slightly different and it isn’t a perfect match for the original. 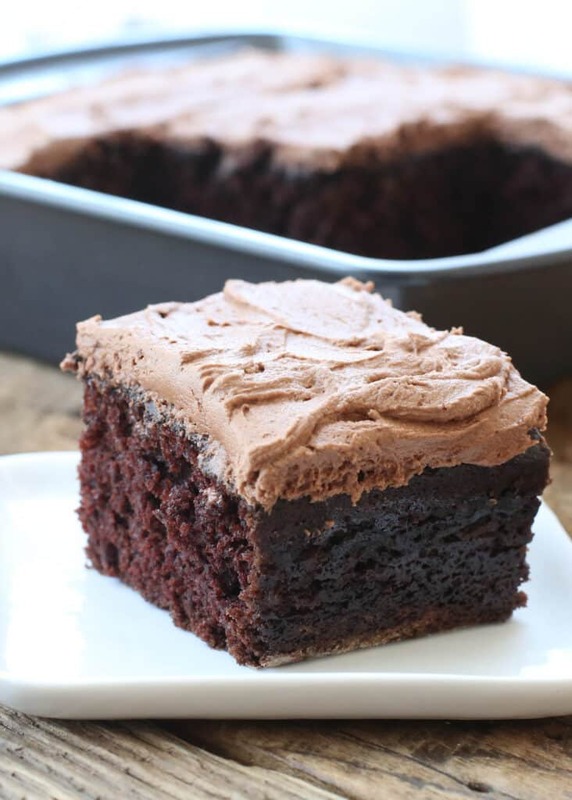 For a gluten free chocolate cake that you’ll still be dreaming about the next day, I highly recommend The Best Gluten Free Chocolate Cake and The Best Gluten Free White Cake. Kitchen Tip: I use this baking pan to make this recipe. Preheat oven to 350°F. Grease an 8-inch square pan with butter. 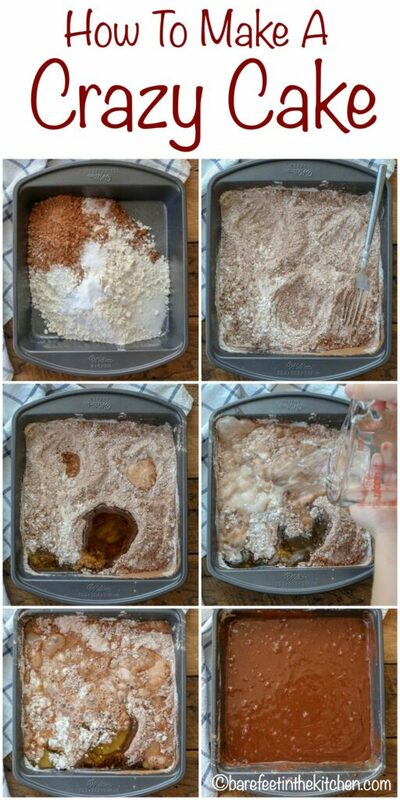 In the greased pan, combine the flour, cocoa powder, sugar, baking soda, and salt. 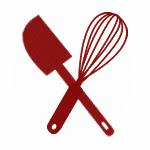 Whisk lightly with a fork or small whisk to combine. Make two small wells and 1 large well in the dry ingredients (as pictured) and add the vinegar, vanilla, and oil to the wells. Pour the water over the top and whisk again to combine thoroughly. Bake for 35 minutes, until a toothpick inserted comes out clean. Cool completely. Sprinkle the cool cake with powdered sugar or top with your favorite frosting. Bake for 35 minutes, until a toothpick inserted comes out clean. Cool completely. Sprinkle the cool cake with powdered sugar or top with your favorite frosting. Enjoy! My mother, sisters, and I have been making this cake for 60+ yers! We never have greased the pan! I often make with dark cocoa. 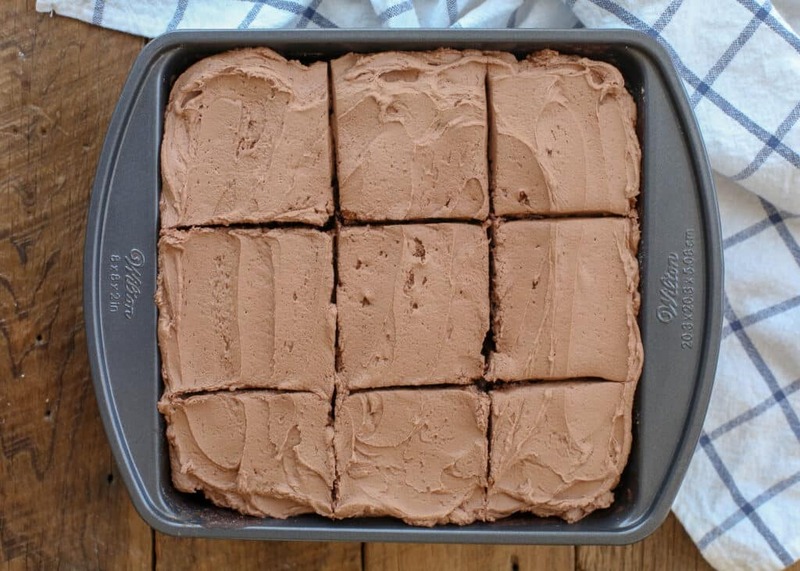 Try this for the BEST frosting: break plain Hershey bars over the cake immediately as it comes out of the oven! Allow to melt and spread as necessary. I use about 4 Hershey bars for the 8 inch pan. I often double the recipe and bake as a 9x13. I have also used mint patties for the frosting, again break over the hot cake and then spread as needed. I tried this cake today because I'd heard good things! I haven't eaten it yet, but it did take 42 min to bake. At 35 it was completely wet in the center. It smells delicious! I bet that's delicious, Patrick!